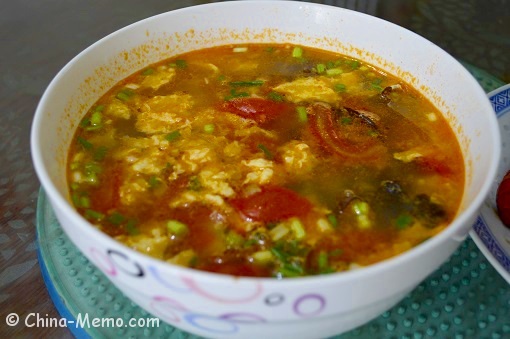 Talking about soup, Chinese homemade soup is different to those soup I have seen in the western countries. As I have noticed in the West, the soup usually contains the mashed vegetables, such as the mashed potatoes or carrots. This kind of soup usually is very thick. Some soups may use cream or butter to make the soup creamy. But Chinese soup is not like that. Our soup is more liquid like, it has vegetables, which maybe chopped, but hardly being mashed. Of course we may add different ingredients and seasonings, but Chinese soup is not thick or sticky. It can be rich in flavour, but not creamy as using the cream. 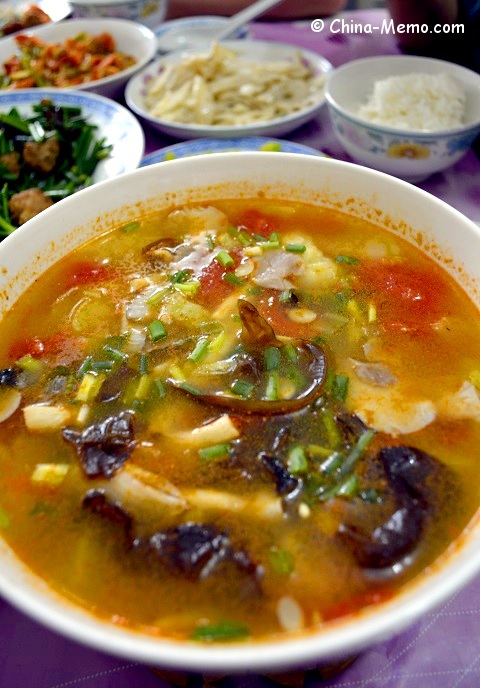 Chinese usually have the soup with the plain rice and several other meat or vegetables dishes. 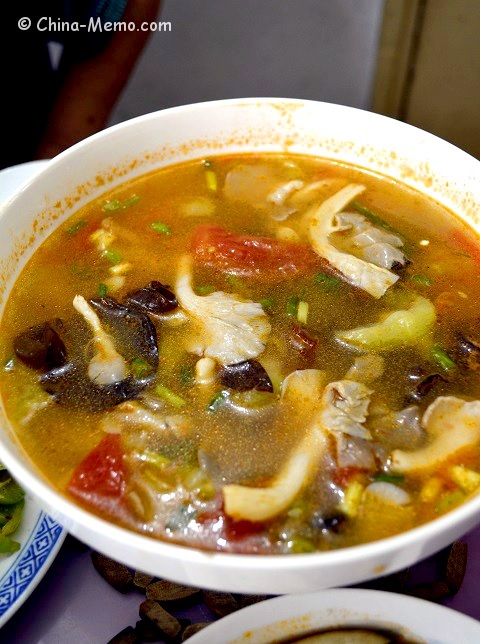 Therefore Chinese soup is not served as a separated course such as a starter in the West restaurants. For this reason, our soup needs to have more liquid as it is better to serve with the other solid food. 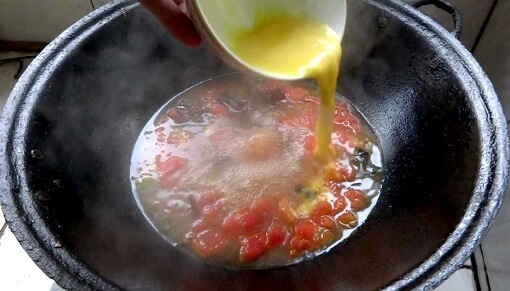 Back to this egg tomato soup, it is a very simple or very basic soup, which does not need a complicated preparation. That's why it is perfect when we want to have a quick meal. Although this soup is so easy as a homemade dish, you cam find it in most local restaurants' menu too. The Chinese name for this dish is call 西红柿蛋汤，xi hong shi dan tang. 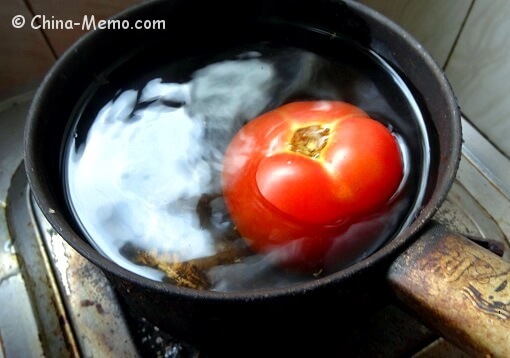 • Bring the water to the boil and put tomato in. 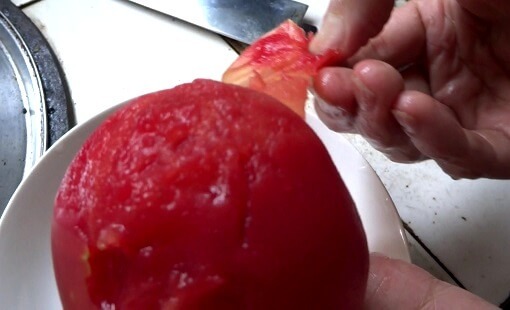 • After about 1-2 mins, take the tomato out and remove the tomato skin. 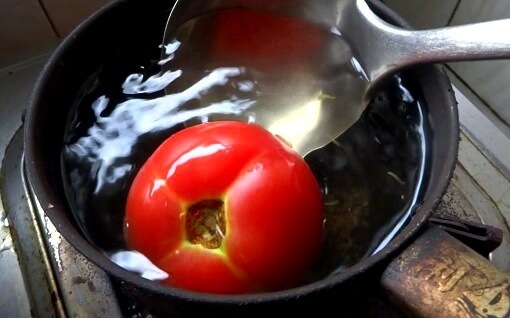 • Cut the tomato into small cubes. • Heat up the wok and add oil till very hot. 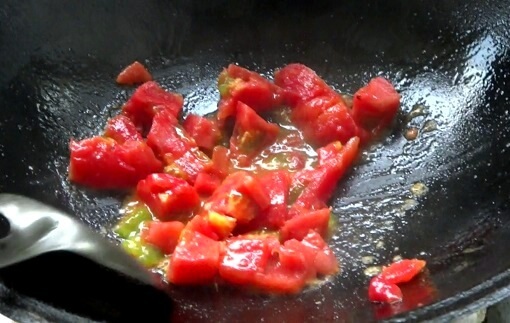 Add the tomato to fry for several minutes. 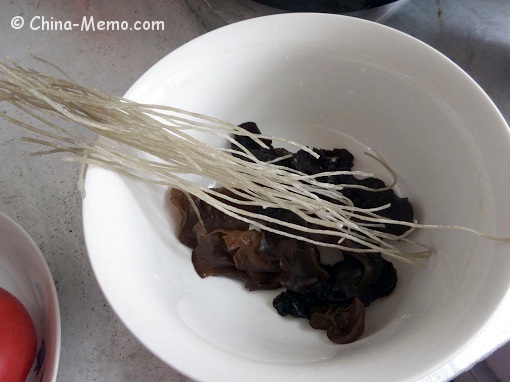 • Add water or stock, rice noodle and wood ears. 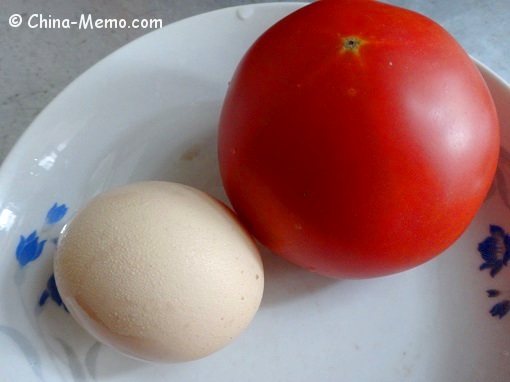 • Bring the soup to the boil and add the beaten egg. Stir the egg to mix with other ingredients. • Adjust the taste as you prefer. To finish, add the spring onions on the top. 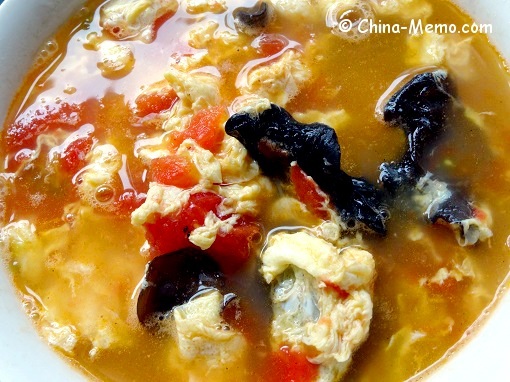 Using the same method, we can also make the Chinese tomato and mushroom soup. Instead of egg, we use the fresh mushrooms and pickled vegetable such as mustard plant. 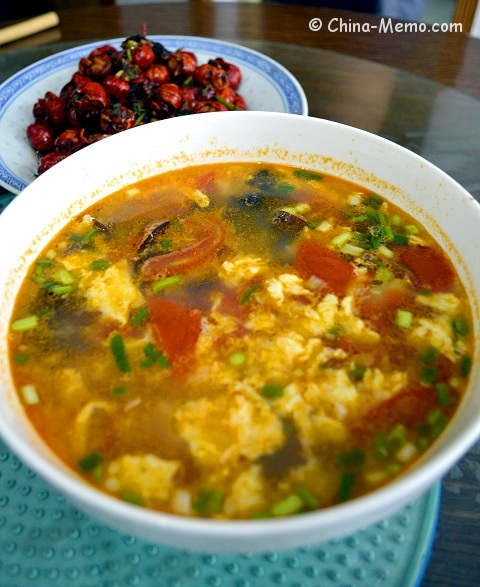 Hope you like this quick and easy Chinese Egg Tomato Soup. 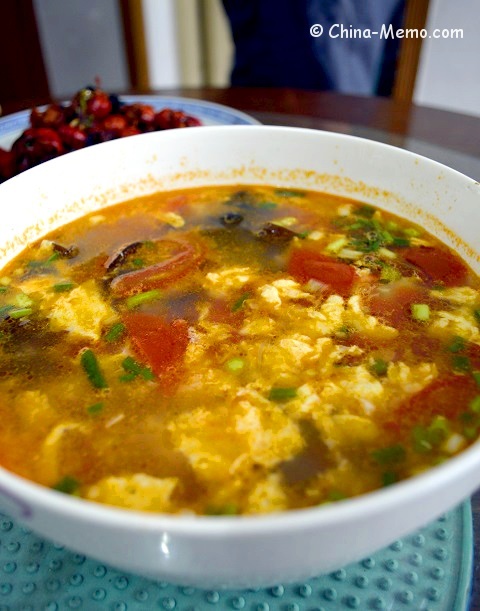 You may check more about Chinese Homemad Soup. 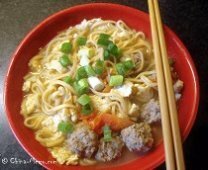 You may also like more Chinese Egg Recipes and Chinese Meat Recipes.